Harris and McConaghey have the Ewings over a barrel. History repeats itself as the Ewings race to stop Cliff Barnes and his cronies Harris and Governor McConaughey from lowering the boom on Ewing Energies on a twist-filled, two-hour episode of Dallas. The Governor is unnerved when the Ewings confront him about his complicity in Cliff’s plan against them at a public appearance on the land he just confiscated from them. After trading threats with John Ross, he calls a meeting with Cliff and Harris and tells them he’ll cut them loose despite his debt to Harris if the Ewings make further progress in their investigation of the plot to destroy Ewing Energies. The Ewings decide to split the task of exploring different avenues to stopping their enemies. Bobby has the sheriff monitor Harris’ truck deliveries while Sue Ellen hires Bum to track down the missing Ken Richards. Bum also picks up some extra spending cash following Cliff on Bobby’s orders. Christopher steps up his campaign to find his mom Pam and learns that dividends from a trust fund were being deposited in a foreign bank account and that her passport lapsed in 1998. Chris pressures the assistant district attorney to have his mother declared legally dead so he can inherit her shares in Barnes Global. Fearing that the hunt for Pam may wind up in a dead-end, Bobby assigns John Ross the task of bringing Pamela Rebecca back into the Ewing fold. When John Ross tells her Cliff was probably behind the explosion at the rig that led to her babies’ deaths, Pamela kicks him out. To her horror, however, she realizes that John Ross told the truth when a smug Cliff himself says losing the babies was a blessing in disguise when he drops by to apologize for not visiting her in the hospital. Bobby finds a dejected John Ross drinking J.R.’s bourbon and tells him that Barnes women always choose family over their men. Pamela proves him wrong, however, when she shows up at John Ross’ place and passionately falls into his welcoming arms. A vengeful Pamela hacks Cliff’s files at Barnes Global but learns her father has covered his tracks very well. When Cliff takes Pamela out to lunch he gives her emerald earrings that his half-sister Katherine supposedly left to him in her will. This plot point puzzles me since Katherine hated Cliff with a passion and wouldn’t give him an heirloom unless it was booby-trapped! Pamela plays hardball with her dad and demands he give her Katherine’s shares in Barnes Global, which she feels are her due. The whole thing is documented by Bum, who reports back to Bobby. John Ross now doubts Pam’s allegiance to the Ewings. Could she be playing for her own one-woman team? Has Elena endangered her relationship with Christopher by protecting Drew? On the other side of Southfork, Drew and Emma are a major casualty of Harris’ war against the Ewings. When Drew suggests they run away together, Emma says there’s no place they can hide from her vindictive father and tells Drew to stay away from her. The stress of the situation accelerates Emma’s dependence on her anti-anxiety medications and Ann discovers them in her bedroom. During their ensuing confrontation, Emma makes it seem like Sue Ellen was the one who was inebriated at the bar where Emma was supposed to meet Drew. An indignant Sue Ellen tells Ann she’s enabling her daughter and making a bad situation worse by believing her lies. After Ann confiscates most of her pills, Emma approaches a ranch hand with a connection to painkillers and doesn’t object when he suggests she pay some of the price of the drugs with sexual favors. When Drew catches them together, she tells him to mind his own business. Behind closed doors, however, Emma has resorted to snorting her pulverized pills. She later confronts her father, who points out that Drew’s problems are the result of her refusal to behave. Sensing her withdrawal symptoms, Harris lures Emma back with a promise to replenish her stash of meds on the condition that she leave Southfork. The Dallas county sheriff reports to Bobby that the latest deliveries by Ryland Transport are perfectly legal. What they don’t know is that Vickers and Harris pulled a switcheroo on them when they delivered the goods to the storage area that Vickers manages. Despite being a hothead, Harris is doing a great job of staying one step ahead of the Ewings. Drew promises to turn himself in after confessing his role in the rig explosion to Elena but opts to go on the lam, leaving behind a signed confession implicating Vickers and taking some weaponry with him. The Ewings launch a manhunt for Drew and Vickers is arrested but is let off later in court due to lack of sufficient evidence. Naturally, he skips town after getting sprung by Cliff & Co.
Pamela just can’t stay away from those Ewing boys. Elena gets a call from Drew and lies to Christopher about not hearing from her brother. She and Carmen meet Drew in the woods and give him $5,000 and an untraceable cell phone. He vows to not rest until he’s found Vickers and rides off on a motorcycle. Elena decides to join Christopher when he plans a trip to Zürich to confront a woman whom bankers there believe to be his mother Pam Barnes Ewing. A photo emailed by the bank showing a pointy-nosed woman whose face is hidden by a big hat looks more like her sister Katherine to me. After all, Katherine had a habit of wearing big hats back in the day and loved to make a dramatic entrance. Might the scene be getting set for the return of this classic Dallas villainess? Hmmm. Time is of the essence after Cliff buys out the Ewings’ bank loan and puts them on the brink of defaulting. If they can’t pay him $200 million in 24 hours, Ewing Energies is his. Cliff has no idea how right he is when he compares notes with Harris on the difficulties of raising daughters. Emma hits rock bottom by getting into a car accident on her way back to Southfork while driving under the influence of drugs so Ann decides to let her cool her heels in jail. She won’t bail Emma out until she agrees to rehab. 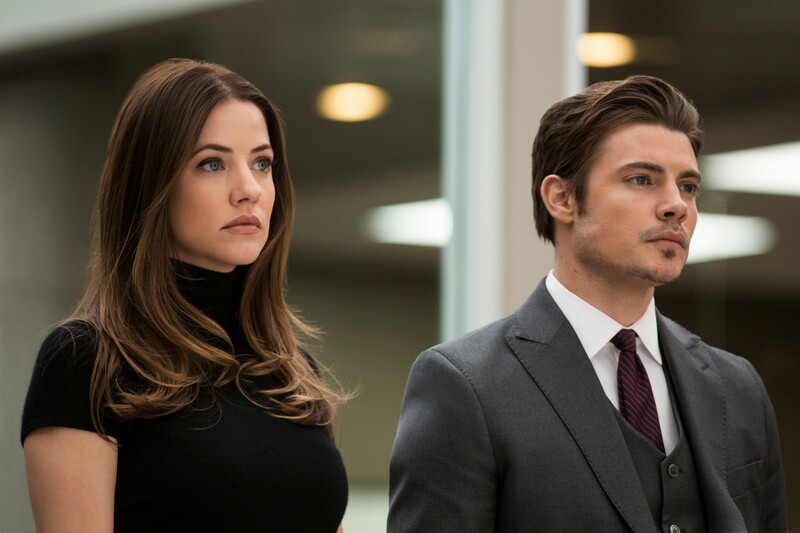 Pamela, meanwhile, shows how far she’s willing to prove her loyalty to John Ross and the Ewings when the scene shifts to a Las Vegas-style chapel where John Ross Ewing marries one-third of Barnes Global! Wait until Cliff gets a load of that! I dearly hope that it’s Katherine who comes back. I love a good villain. You and me both, Sandy! Fingers crossed! I love the development over the season of John Ross and Pamela Rebecca. I’ve been saying for awhile now that I think Henderson and Gonzalo can be the future of this show, and keep it moving forward. I’m glad to see the producers are making an investment in this couple. I agree, J.R. They sizzle together. Could be like the J.R. and Sue Ellen of the new generation.